Nigerian real estate and construction market post rebasing has been seen to contribute significantly more to the Nations’ GDP than previously recorded. However, this contribution seems to have quickly slowed down showing negative growth between Q4 2015 and 2016 and remaining stagnant into 2017. This is in line with the general growth in GDP, which has seen decline in the Q1 and Q2 2015, the weakest since 2013. The growth moderation of the non-oil sector (real estate and construction inclusive) in 2015 in comparison to 2014, is attributive to lower government spending (due to lower oil receipts), disruptions to the fuel supply and some monetary policy actions aimed at managing the pressures of foreign exchange demand. Construction companies; small and large, slowed down over the period in review. Reports state that over N600 Billion is being owed construction companies by the Federal Government. Following this, these firms have been forced to abandon projects and lay-off as much as 10,000 workers across the country. The present political administration has stated that the past administration failed to release capital votes since the second quarter of 2014. In all, 6,525.63km of roads have been stalled in the country. The effects of political and economic uncertainty was far reaching; stalling investment decisions of households and corporations alike. Real estate being capital intensive in nature was absolutely unimmunized to this. Many new constructions, renting or purchasing decisions have been stalled till there is a more enabling environment. It is expected that there will be a notable increase in leasing activity and take-up, particularly in recently delivered A-grade buildings as Tenants take the opportunity to relocate from Grade B or lower quality office space to newer Grade A buildings with new or upgrading tenants. Rental values are poised to continue on a downward trajectory in 2017, which will drive the rental market upward. With the rebasing of the economy from a monolithic (oil dependent economy) to other services, construction and real estate and technology driven economy, we should see office demand increasing significantly in 2017, with most of the expected demand for space to be in the range of 250m² to 500m². We expect to see more owner-occupier office buildings in 2017. Major insurance companies, oil companies and technology companies are already taking advantage of the devaluation of the Naira and buying up prime lands for office development. Q1 2017 started with the development of Cornerstone Insurance headquarter beside Sheraton 4 Point, Victoria Island. Techno Oil has completed its office building in Oniru, Victoria Island in Q1 2017. A change in overall perceptions has been the theme for the office market in Lagos over the past 12 months. After almost a decade of unsustainably high rents, increasing supply, tougher economic conditions and all round uncertainty, markets are correcting. With over 83,000m² of office space delivered in 2015, and an additional 100,000m² expected to come onto the market in 2016, competition amongst landlords has been tight, subsequently resulting in rental reductions and tenant-friendly incentives. Rents for prime space in Ikoyi and Victoria Island (VI) have fallen by up to 12.5% since Q1:2015 which is a further indication of competitive market conditions. While the development pipeline for office space in Lagos is expected to slow down significantly after 2016, some pressure is still expected on rental growth and market activity as the Nigerian economy struggles to regain momentum. Offices in Port Harcourt are largely self-occupied, converted or purpose-built structures for specific organizations. Smaller organizations often rent residential apartments or standalone houses and convert them to offices. A thirdparty office space market as an investment sub-set is almost nonexistence, with only a handful of buildings dotting Stadium Road, Olu Obasanjo Way, Trans Amadi Road and Aba Road. Residential block of flats on Ikwere Road have all been converted to offices and shops to cater to a lower cadre of businesses. In 2015, rents either stayed constant or improved only slightly. 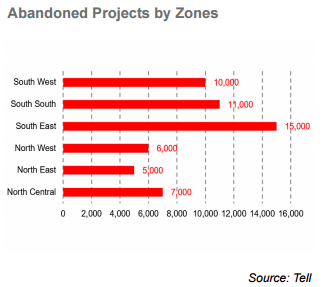 Prime office space in Abuja is concentrated in the CBD, Wuse 2 and Garki Area 11. The development pipeline of mid-range space is also quite rich in Utako. As expected with any capital city worldwide, majority of the buildings are public offices that house various government ministries, departments or agencies. However a number of third party office blocks dot the Abuja skyline. In few cases, some Government agencies put up some space within their buildings for lease. In Wuse 2, Area 11 and 10 (mentioned in order of desirability), there are various ‘plazas’ that house from as little as 12 office spaces to over 100 with office spaces measuring as little as 12sqm to as large as 100sqm floor plates. Developments of this kind (Plazas) saw a number of completions in 2015, and in some cases, office spaces were sold rather than being leased for yearly rents. Most organizations spend up to 30% of their total operating expenditure on rents and Facilities-related activities, “for example, if you take a company with turn-over of N1 billion and you are operating a cost to revenue ratio of 60%, leaving you with a gross of 40% and a net of probably 25%, it means #200 million of what you spend relates to maintenance”. However, facility management cost can be reduced by developing ‘smart buildings’, that means concerns and issues related to Facility Management must be addressed at the design stage of any real estate construction. Property Taxes in Nigeria There are various taxes that apply to real estate or real property transactions in Nigeria. The common public perception that there are no real estate taxes in Nigeria is not correct. Companies Income Tax and Personal Income Tax. State Property Taxes – Lagos State Land Use Charge Law and the Federal Capital Territory Property Tax. The outlook for the Nigerian real estate market in 2017 is positive and will be largely dependent on the overall performance of the economy as the demand, supply and price of space is contingent to the wellbeing of occupiers, developers and investors. While the development pipeline for office space in Lagos is expected to slow down significantly in 2017. Lagos will continue to take the lead, Abuja and 2nd tier cities to follow. With over 25,000sqm to be delivered, Ikoyi in particular may officially become the prime office destination while Eko Atlantic gradually moves beyond infancy. Some pressure is still expected on rental growth and market activity as the Nigerian economy struggles to regain momentum. As liquidity increases to compliment the high consumer spending culture of Nigerians, retail business will soar and demand for retail space will follow. This will also be premised on the removal of bottlenecks currently felt by all in the retail value chain; it is expected that reasonable appeals for change will not fall on deaf ears for too long. Similar to the office sub-market, the retail pipeline is very rich with over 100,000sqm of lettable space to be delivered within the next 12 months. These projects are primarily led by a few developers/investors who have successfully delivered similar projects in the region. It is however expected that new completions will be better looking and take into consideration lessons learnt from past developments. Beyond the existing pipeline, malls may get bigger in prime locations (Abuja and Lagos), to cater to more entertainment features lacking in existing stock. Such malls will do well to be located in currently un-serviced nodes such as Ogudu or Magodo in Lagos. It is also expected that retail projects will emerge in locations beyond the south and move towards the middle belt and Northern states such as Kaduna. With the new government Improvements in trade relationship (especially with China) and investment with emphasis on the non-oil sectors, more office spaces will be required to cater for the new entrants. In all, the real estate market will be responsive/ reactive to the positive economic sentiments. The 2017 Budget has been described as the ‘Budget of Recovery and Growth’. With a budget size of N7.298tn. 2017 budget is 20.4% higher than 2016 estimates. It provides a clear road map of policy actions and steps designed to bring the economy out of recession and to a path of steady growth and prosperity. Key capital spending provisions in the Budget amounts to over N2.24tn (30.7% of total budget), which includes several infrastructural projects. The writer, Mr Ayodele Thomas is a seasoned Commercial Real Estate and Investment Consultant with over 15 years of global Real Estate experience.